It’s becoming normal for grown-up children to spend years at home even after starting work, because of the mismatch between salaries and rents. 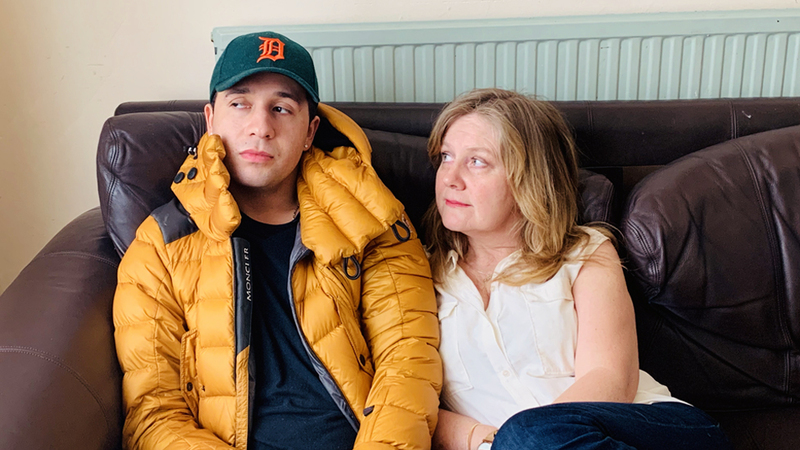 Sue Elliott-Nicholls and her son, Morgan Elliott, agree that it can be a nightmare. Here’s Sue’s story with interjections from Morgan. An unusually warm spring day. I skip up to the door of the family home, it’s been a good day at work and a pleasant cycle home. I’m enjoying the lighter evenings and I’m home early – it’s only four o’clock! Maybe I can have a cuppa out in the back yard. I open the front door and a Sahara-like jet of air billows out. HE’S GOT THE BLOODY HEATING ON! I tell a neighbour. She produces a bath plug from her pocket. “I take it out with me so he can’t spend all afternoon in the bath, while I’m out working to keep a roof over our heads,” she says. You may be forgiven for thinking we’re both in dysfunctional relationships with men, and in a sense we are – with our sons! Our sons in their 20s, who are forced to live at home because their wages won’t cover London rents (and I mean just the rents, you can forget other bills). According to the Civitas think tank, 49% of 23-year-olds are now living with their parents, up from 37% in 1998. These are our kids. The ones who aren’t privileged enough to enjoy the services of the bank of mum and dad, but are privileged enough to enjoy (or not) the lodgings of mum and dad, at a hugely subsidised rent. I have to say at this point that my son Morgan is not lazy. Hard-working, driven, determined to earn money and get on in life – how else would he pay for his trainer habit? I feel for him too. After three years living in Manchester, enjoying independence, spreading his wings, leaving dirty dishes in the sink and festering towels on the floor, to have to come back to a small room in a terraced house where all your conversations – your every breath – can be overheard… that must be desperate. How do I stop myself from turning back into nagging mum and let the boy breathe? Morgan Elliott comments: This Moncler jacket that I basically spent my whole student loan on isn’t proving enough for the Arctic conditions I’ve found myself in recently. I don’t even think Bear Grylls would be able to survive the temperatures that my mother chooses to put us through. It’s ironic that she spends literally a tenner a day on coffee but she can’t afford to heat up the house for her dear son. There are glasses in the dishwasher full of dirty water because they have been loaded the wrong way. He has a university degree, how can he not know how to put a glass in a dishwasher? The glass is neither half-full nor half-empty; the glass is fully full WITH SCUMMY DISHWASHER WATER. The luxury chorizo sausage that was meant for a family tea has been demolished. Maybe I can use the chicken breast instead? No, apparently not. Or the lamb chops? No. All gone. We have regressed. He into petulant teen, me into screeching banshee. Morgan comments: Seeing as I’m her son, it makes sense for my mum to want to feed me. However, this doesn’t seem to be the case. Sometimes I’ll spot a bit of chicken in the fridge and I might just decide to cook it up into a wholesome meal. Mum’s phone’s off but I’m sure providing her son with something to eat won’t be too much of a problem. This is always a big regret though. This small decision of mine has now somehow become a case of me potentially being kicked out of the house, and this isn’t even an exaggeration. “YOU’RE A 23-YEAR-OLD MAN!” she screams. Exactly! And a 23-year-old man needs to eat! Take the heating, again. Have I mentioned the heating? If it’s cold when I’m working at home I light the fire in one room, Ebenezer-Scrooge-like. Imagine my wrath when I see him flitting about the house in a T-shirt and boxers with all the radiators full on. What to do in this instance? Option 1. Ground him. No he’s 23, this is not a real option. Option 2. Ask him to pay more rent and risk an argument over money. Option 3. Let it go in a Zen-like fashion and pay the extra heating bill, ignoring the nagging voice that tells you what a mug you are. It’s the hidden expense that Morgan doesn’t see. It costs money to use an entire washing machine cycle for a pair of shoelaces. The oven turned up to gas mark nine to cook one sausage – and then left on for the rest of the day, costs money. He tells our son tales of how, in his day, he was expected to contribute most of his wages to the family coffers, putting the money in a teapot. “But that was 350 years ago and times were harder then,” I interject – once again undermining him, just as I did when the boys were little. The whole family is regressing. If we were flatmates one of us would be under the floorboards rolled in a body bag. But then, as so often happens in families, moments later you’re laughing in the kitchen, everything is forgotten in an instant. Morgan comments: Annoyingly for me, I happen to have a lot of wealthier friends and so the idea of my mum taking money from me instead of giving me money towards rent seems absurd. It isn’t really a problem in itself, and I do completely understand that bills need to be paid, but it seems my rent is increasing on almost a monthly basis. My mum will look for any excuse to raise it – the more I earn the more she wants me to pay! The whole system kind of feels like some sort of online scam in which you subscribe and in the small print it says *rent will increase by £50 each month*. A six-month contract would at least give me an idea of how to budget for the coming months. And yes, that may include buying trainers. Morgan says he feels judged by us and to a certain extent that’s true. We got to play out our mistakes in rented flats above shops, visiting our parents with the fresh-faced clean-living industrious demeanour reserved for them and them alone. But I also feel judged by him. When we’re sprawled out on the sofa on a Friday night with a bottle and a bag of Kettle chips and the boys are going out around the time we’re thinking of going to bed I feel like a social failure. Morgan comments: Talking about judging, imagine this non-hypothetical scenario: I’ve just got home from work and I’m completely exhausted – for once I feel like a cheeky smoke. In summer I’d happily take a leisurely stroll down to the park at the end of the road, but right now the garden seems more appropriate. BUT… if I get caught then my mum will definitely think I’m a crackhead, and judging by the commotion she causes when I turn up the heating she definitely can’t afford to send me to rehab this year. Also, my brother’s window’s open and if the wind blows the fumes into his room my dad will definitely sniff me out and shut down my operation swiftly. Not that he was any better at my age. Yes it’s true, I do judge… noticing his new trainers. “Why are you buying £150 trainers when you could be saving for a deposit on a flat?” I casually mention. No sooner are the words out of my mouth than I wish I could take them back again. Because why shouldn’t he? When I was younger, in fact when he was a baby, I bought myself expensive clothes because at that time I hadn’t got a hope of buying a house, so why not? “If I’m paying rent I should at least be able to bring girls back,” he says. Well, girls yes, as in girlfriends. But ultimately this is still a family home (not that his teenage brother would mind – it would give him an excuse to do the same). Living in an alpha male household there’s nothing I love more than a girlfriend – I’m almost begging them not to leave me as they walk out of the door. But it’s not a bachelor pad and so I’d at least like to see them and chat to them. Now I feel like a prude. A neurotic, prudish, stingy harridan. Do other cultures know how to do it better? Do they have the rules – the family traditions that make inter-generational living easier? Morgan comments: It’s 3am in Shoreditch and I feel like I could have just potentially met my future wifey. We’ve walked around the area about 10 times trying to find a bar that’s still open but it seems like we’re out of luck… I’m acting like I don’t actually have anywhere to take her back to. I do of course, but I’m not sure how comfortable she will be meeting the Munster family just yet. They’ll assume she’s my girlfriend and start questioning her. Or worse, what if there’s something unpleasant left in the toilet? I’m really starting to doubt whether the cheap rent in Dalston is worth it. When I was younger, it was a lot easier bringing girls back – but now I’m bringing grown women back, ready to challenge the domain of the lioness. “The next thing is he’ll leave and then you’ll miss him,” says a friend. A study carried out last year by the LSE concluded the boomeranging generation causes a significant decline in parents’ mental health. But I know I will miss him when he’s gone. My kids are now 17 and 23 and when we’re all chatting in the kitchen, or I hear them laughing in the living room I come over all emotional at how fantastic they both are. They are excellent company, funny, interesting, thoughtful, and their banter is on point.